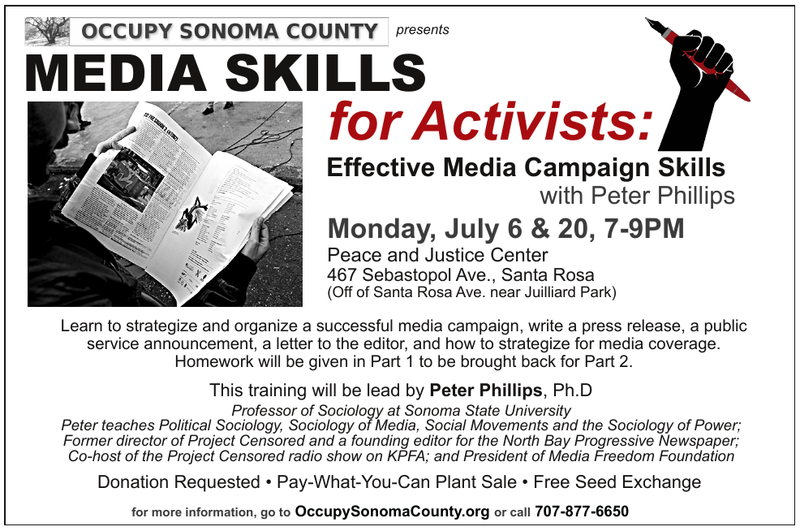 Occupy Sonoma County ​​ Internal Teach-In ​ Media Skills For Activists: How to write a press release and a public service announcement *All OSC people are requested to attend* Non-OSC ​g​uests are invited See registration details below Monday, ​June 30​, ​7:0​0-9:00 PM. 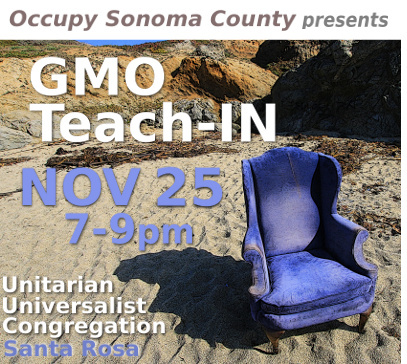 ​Peace and Justice Center​ ​467 Sebastopol Ave​., Santa Rosa (​Off of Santa Rosa Ave.
A special teach-in from a pioneer in the holistic health, nutrition and culinary arts field. 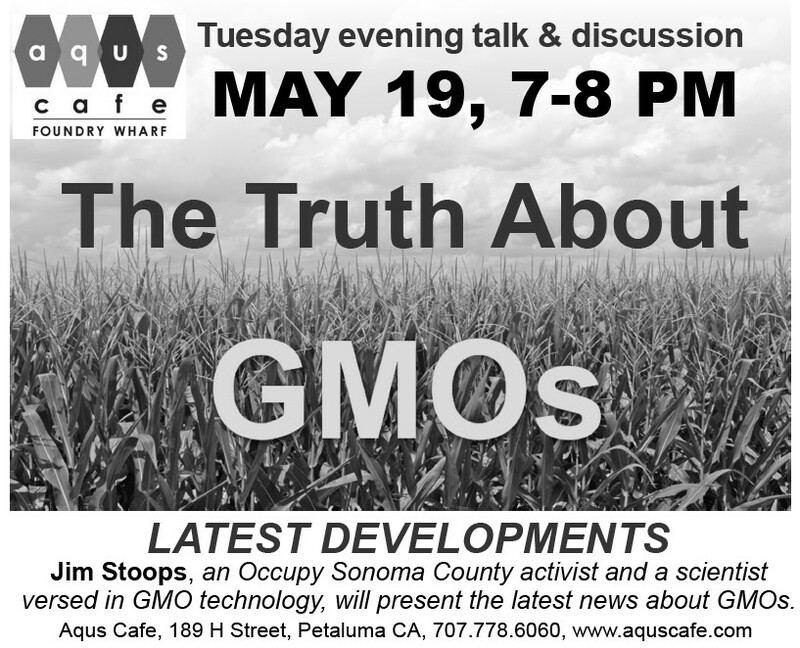 Dr. Ed Bauman will help us sort through current fads and myths in the food market place. 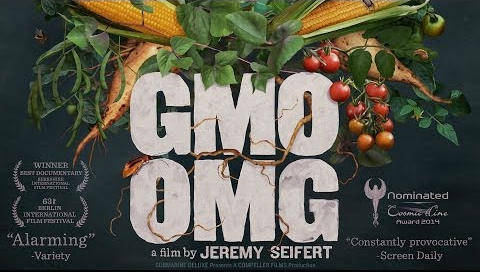 Learn how to discern real food from food products, read food labels and avoid GMOs. 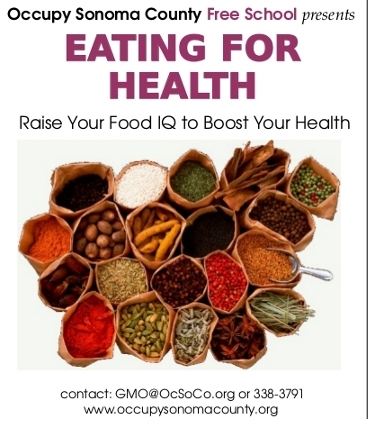 Take away tips and tools to raise your food IQ on how to source, prepare and eat flavorful, health supportive S.O.U.L. 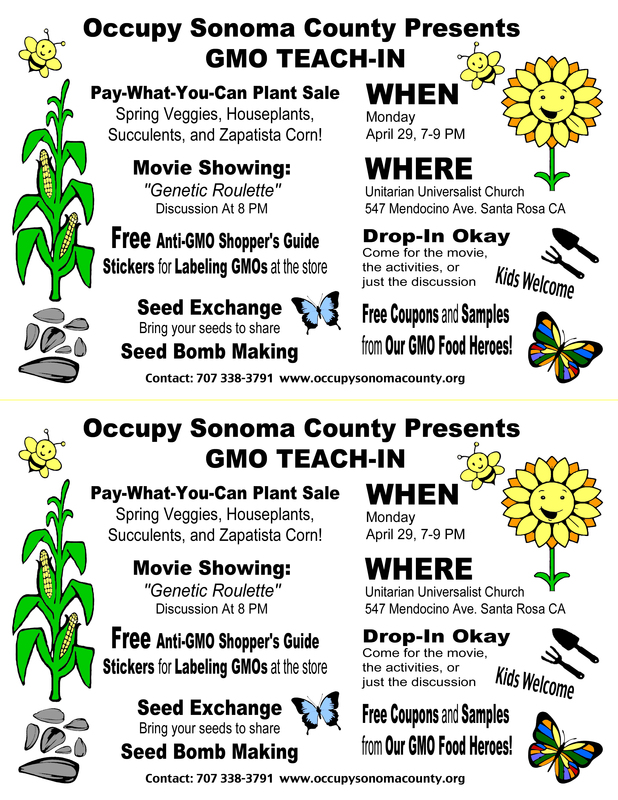 (seasonal, organic, unprocessed and local) foods. Change your foods, boost your health, change your life! 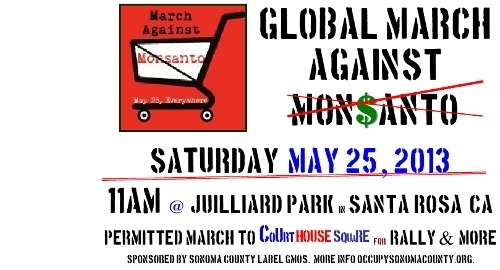 Focus: defeats of recent GMO labeling initiatives; Dollarocracy and Corporate control of our food supply, strategies for stopping GMOs, next steps for our movement. 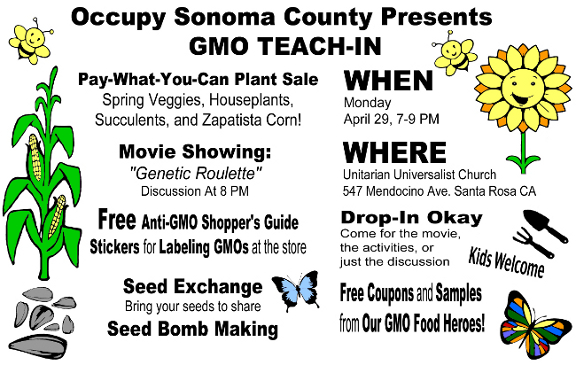 Pick up a GMO Free Shopping Guide, Taste some GMO Free Snacks and take home your very own Winter Seed Bombs to plant. 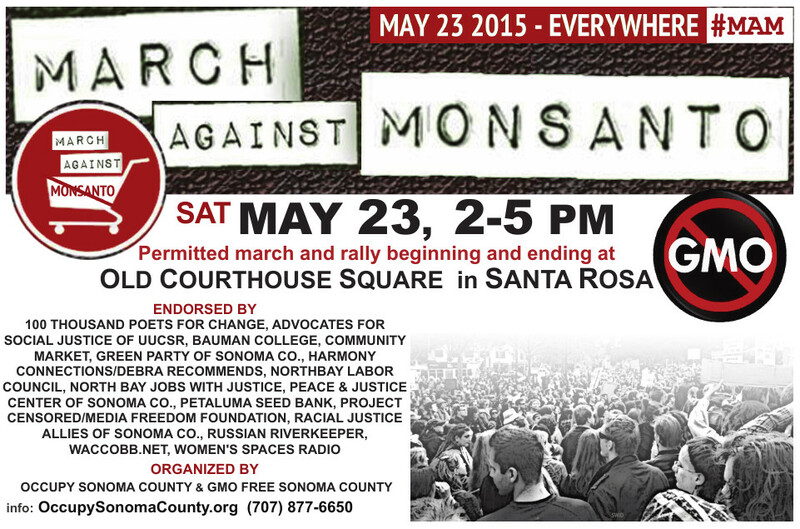 March Against GMO's, Roundup & Corporate Power! Permitted march through the community. Rally and more back at City Hall. 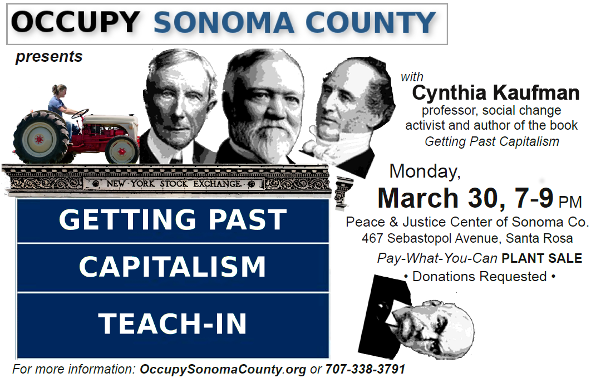 Everyone in Occupy Sonoma County (OSC) is requested to attend this June 3 training event. 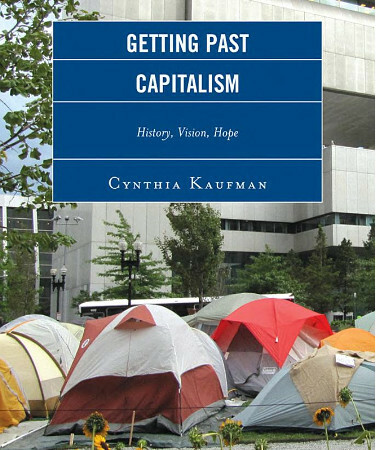 The training is part of our internal skill-sharing to equalize power in the group and train everyone in basic activism skills. 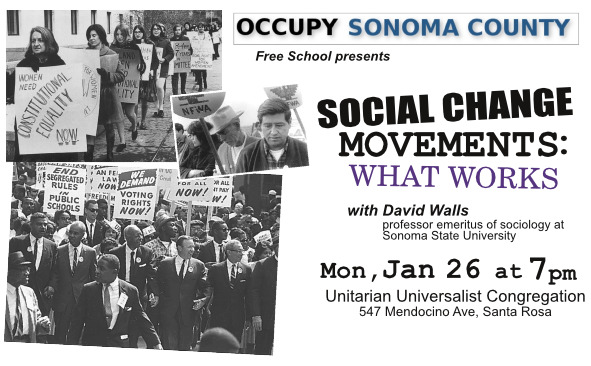 Please plan to attend. Cost: currently the proposal is to offer the training for free to all OSC people (anyone who has ever attended an OSC meeting is considered part of OSC). 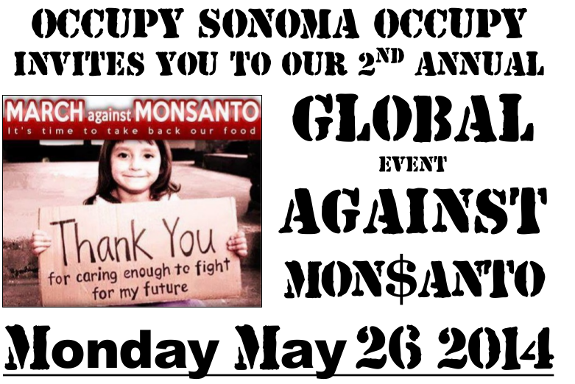 Anyone not in the OSC is asked make a voluntary donation of $5 to $20 to help cover the expenses of the trainers who will be traveling here from Oakland.